and resellers to make huge profits. good to your clients, and satisfied clients refer others. We know we can only grow by helping you grow. If you would like a custom quote on a specialized server and/or web/application development project, please send requirements to . We can provide custom, managed solutions from a single server to a secure, load-balanced cluster with private-branded support. Payment methods accepted: We accept secure payments through Paypal and 2Checkout. 2Checkout - VISA, MC, Am. Express, Discover, Diner's Club, JBC, VISA/MC debit cards. Before ordering, please read our terms of service. For plan and software details, please see the features page. After you sign up for an account, we will send an email to you containing instructions to log into your control panel. These affordable plans are perfect if you need only one web site. See the FEATURES page for plan details. After signing up, you will instantly be sent a welcome email with your login details. The latest Linux and Windows versions are included. Cpanel is the control panel included on Linux and Unix. Windows plans include the latest version of Plesk 8.x. Host unlimited domains in your reseller account using web host manager (WHM), each having it's own cpanel account. See the FEATURES page for plan details. After signing up, you will instantly be sent a welcome email with your login details. The latest Linux, and Windows versionsare available. Windows plans include the latest version of Plesk. Cloud Hosting comprises of several servers in a cluster that in essence virtualize the hardware layer, giving the primary benefits of scalability and flexibility that allow virtual dedicated servers and appliances such as load balancers to be added very easily and quickly to the cluster. All hardware in the grid cluster is 100% redundant. This is a very good alternative for those who need the flexibility to easily and quickly add more resources, and is an excellent alternative to a full dedicated server because of the many layers of hardware redundancy. And unlike a VPS, these virtual servers allow you to even have an isolated environment, and you can add appliances such as your own load balancers and divide your Cloud Server into unlimited Virtual Servers. Custom plan sizes are available. Virtual Private Server (VPS) plans divide a single server into isolated containers, essentially emulating a dedicated server in almost every respect. This provides dedicated CPU, memory and operating system files, to each client. A VPS allows you to host large forums, stream media, download-sites, or store large amounts of archives. In addition you get full root access so you can sell reseller plans in your account. 24x7 security & server admin is included. For Linux hosting, we provide the newest version of cPanel (cpanel features),and add the Fantastico Deluxe free script library. Then for managing your server we provide you with WHM (whm features) . FreeBSD not available. For Windows hosting we provide the latest version of Plesk 8, (plesk features) with Power Pack (includes the top 4 add-ons listed here) . Custom plans are available. Each dedicated server includes a generous package of features. We start off with cPanel (see cpanel features), the best control panel in the industry. Then we add Fantastico F3, the popular scripts library that you and your customers will love. Then for managing your server we provide you with WHM (see whm features). The following section gives you a detailed overview of exactly what you will be getting with your dedicated server. Upgrades to 100TB of bandwidth are available for $150 per month. Each server will be fully set-up and hardened to be hacker-resistant when you are provided root access, so all you need to do is start adding customers. 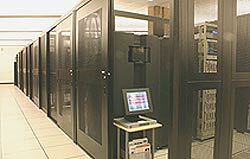 24x7 server administration, monitoring, and security services are included. Customized Servers with any configuration can also be built for you. Linux and FreeBSD use cpanel. Windows servers are running the latest versions of Plesk (ask about Helm if you are interested). Most dedicated servers are available between 24 and 72 hours. These High-End servers are faster than all of the ones listed in the regular dedicated server section.. These are some of the fastest servers available and are built for redundancy. Each dedicated server includes the same generous features like cpanel (see cpanel features) the Fantastico Script Library, and WHM (see whm features), a minimum of 16GB of RAM and include RAID. Upgrades to 100TB of bandwidth are available for $150 per month. Each server will be fully set-up and hardened to be hacker-resistant when you are provided root access, so all you need to do is start adding customers. 24x7 server administration, monitoring, and security services are included. Available with the latest Linux, or Windows Operating System. If you need the power of two CPUs, all of the servers below are for you. to stream a shoutcast server, radio station, movies, or you have more than 15 terabytes of monthly data transfer, these Monster servers can be the best option. Upgrades to 100TB of bandwidth are available for $150 per month. Linux or Windows are both available. Included are cPanel (see cpanel features), WHM (see whm features), and the Fantastico script library. Each server will be fully set-up and hardened to be hacker-resistant when you are provided root access, so all you need to do is start adding customers. 24x7 server administration, monitoring, and security services are included. Available in Linux, FreeBSD or Windows. Our game servers have some of the fastest ping times across the world. Match your game requirements with the right server and you can resell game slots to gamers as a profitable business. Off site backups are an additional cost. Servers are available in Linux or Windows and include TCAdmin control panel, which is the easiest gamer panel to use and manage your games. We provide space, bandwidth and power for your own equipment with a 100% uptime guarantee. Buying your own equipment and having it hosted in a managed colo environment, you can save thousands over leased server costs over time. If you need trained hands and eyes, that is also included. Colo space is located in New Jersey. We will send you a custom payment link once you complete the order form. "Integrity is a mindset that guides our personal and professional behavior requiring honesty, trustworthiness, and character." are registered trademarks of INTEGRITYHOST INC. Copyright 2005 Integrity Host Inc.